Not to be confused with Tonsillitis. Peritonsillar abscess (PTA), also known as a quinsy, is a recognized complication of tonsillitis and consists of a collection of pus beside the tonsil in what is referred to as peritonsillar space (peri—meaning surrounding). It is a commonly encountered otorhinolaryngological (ENT) emergency. Unlike tonsillitis, which is more common in the pediatric age group, PTA has a more even age spread, from children to adults. Symptoms start appearing two to eight days before the formation of an abscess. A progressively severe sore throat on one side and pain during swallowing (odynophagia) usually are the earliest symptoms. 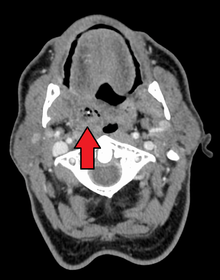 As the abscess develops, persistent pain in the peritonsillar area, fever, a general sense of feeling unwell, headache and a distortion of vowels informally known as "hot potato voice" may appear. Neck pain associated with tender, swollen lymph nodes, referred ear pain and foul breath are also common. While these signs may be present in tonsillitis itself, a PTA should be specifically considered if there is limited ability to open the mouth (trismus). Physical signs of a peritonsillar abscess include redness and swelling in the tonsillar area of the affected side and swelling of the jugulodigastric lymph nodes. The uvula may be displaced towards the unaffected side. PTA usually arises as a complication of an untreated or partially treated episode of acute tonsillitis. The infection, in these cases, spreads to the peritonsillar area (peritonsillitis). This region comprises loose connective tissue and is hence susceptible to formation of an abscess. PTA can also occur de novo. Both aerobic and anaerobic bacteria can be causative. Commonly involved aerobic pathogens include Streptococcus, Staphylococcus and Haemophilus. The most common anaerobic species include Fusobacterium necrophorum, Peptostreptococcus, Prevotella species, and Bacteroides. Treatment is surgical incision and drainage of the pus, thereby relieving the pain of the pressed tissues. Antibiotics are also given to treat the infection. Internationally, the infection is frequently penicillin resistant, so it is now common to treat with clindamycin or metronidazole in combination with benzylpenicillin (penicillin G). Treatment can also be given while a patient is under anesthesia, but this is usually reserved for children or anxious patients. Tonsillectomy can be indicated if a patient has recurring peritonsillar abscesses or a history of tonsillitis. For patients with their first peritonsillar abscess most ENT-surgeons prefer to "wait and observe" before recommending tonsillectomy. The number of new cases per year of peritonsillar abscess in the United States has been estimated approximately at 30 cases per 100,000 people. In a study in Northern Ireland, the number of new cases was 10 cases per 100,000 people per year. In Denmark, the new number of new cases is higher and reaches 41 cases per 100,000 people per year. Younger children who develop a peritonsillar abscess are often immunocompromised and in them, the infection can cause airway obstruction. The condition is often referred to as "quincy", "quinsy", or "quinsey", anglicised versions of the French word esquinancie which was originally rendered as squinsey and subsequently quinsy. George Washington was believed to have died of complications arising from quinsy, but is now thought to have died from epiglottitis. James Gregory of the band The Ordinary Boys almost died from quinsy because it was left untreated for so long before emergency treatment was started. Eiichiro Oda, author of the best-selling One Piece manga, was hospitalized due to complications. Ian Maclaren died of complications from quinsy while on a lecture tour of the United States. 1 2 Raut, VV (2000). "Management of peritonsillitis/peritonsillar". Revue de laryngologie - otologie - rhinologie. 121 (2): 107–10. PMID 10997070. ↑ Brook I, Frazier EH, Thompson DH (March 1991). "Aerobic and anaerobic microbiology of peritonsillar abscess". Laryngoscope. 101 (3): 289–92. doi:10.1288/00005537-199103000-00012. PMID 2000017. ↑ Sakae FA, Imamura R, Sennes LU, Araújo Filho BC, Tsuji DH (2006). "Microbiology of peritonsillar abscesses". Braz J Otorhinolaryngol. 72 (2): 247–51. PMID 16951860. Retrieved 2014-06-12. ↑ Gavriel H, Lazarovitch T, Pomortsev A, Eviatar E (January 2009). "Variations in the microbiology of peritonsillar abscess". Eur. J. Clin. Microbiol. Infect. Dis. 28 (1): 27–31. doi:10.1007/s10096-008-0583-6. PMID 18612664. ↑ Sunnergren O, Swanberg J, Mölstad S (2008). "Incidence, microbiology and clinical history of peritonsillar abscesses". Scand. J. Infect. Dis. 40 (9): 752–5. doi:10.1080/00365540802040562. PMID 19086341. ↑ Klug TE, Henriksen JJ, Fuursted K, Ovesen T (May 2011). "Significant pathogens in peritonsillar abscesses". Eur. J. Clin. Microbiol. Infect. Dis. 30 (5): 619–27. doi:10.1007/s10096-010-1130-9. PMID 21181222. ↑ Powell EL, Powell J, Samuel JR, Wilson JA (September 2013). "A review of the pathogenesis of adult peritonsillar abscess: time for a re-evaluation". J. Antimicrob. Chemother. 68 (9): 1941–50. doi:10.1093/jac/dkt128. PMID 23612569. ↑ Steyer TE (January 2002). "Peritonsillar abscess: diagnosis and treatment". Am Fam Physician. 65 (1): 93–6. PMID 11804446. ↑ Visvanathan V, Nix P (April 2010). "National UK survey of antibiotics prescribed for acute tonsillitis and peritonsillar abscess". J Laryngol Otol. 124 (4): 420–3. doi:10.1017/S0022215109991939. PMID 19930783. ↑ Johnson RF, Stewart MG (June 2005). "The contemporary approach to diagnosis and management of peritonsillar abscess". Curr Opin Otolaryngol Head Neck Surg. 13 (3): 157–60. PMID 15908813. Retrieved 2014-06-12. ↑ Hanna BC, McMullan R, Gallagher G, Hedderwick S (April 2006). "The epidemiology of peritonsillar abscess disease in Northern Ireland". J. Infect. 52 (4): 247–53. doi:10.1016/j.jinf.2005.07.002. PMID 16125782. ↑ Ehlers Klug T, Rusan M, Fuursted K, Ovesen T (November 2009). "Fusobacterium necrophorum: most prevalent pathogen in peritonsillar abscess in Denmark". Clin. Infect. Dis. 49 (10): 1467–72. doi:10.1086/644616. PMID 19842975. ↑ Hardingham M (May 1987). "Peritonsillar infections". Otolaryngol. Clin. North Am. 20 (2): 273–8. PMID 3474580. ↑ "PERITONSILLITIS (PERITONSILLAR CELLULITIS AND PERITONSILLAR ABSCESS)". Marx: Rosen's Emergency Medicine (7th ed.). Mosby, An Imprint of Elsevier. 2009. Retrieved 8 July 2013. ↑ Richard Gleason Greene (1890). The International cyclopedia: a compendium of human knowledge, Volume 12. Dodd, Mead. pp. 355–6. ↑ Juvaini, Ala-ad-Din Ata-Malik (1997). History of the World Conqueror. Manchester U.K.: Manchester University Press. p. 314. ↑ Wickman, Patricia Riles (2006). Osceola's Legacy. University of Alabama Press. p. 144. ↑ Montaigne, Michel de, Essays of Michel de Montaigne, tr. Charles Cotton, ed. William Carew Hazlitt, 1877, "The Life of Montaigne" in v. 1. n.p., Kindle edition. ↑ "Ordinary Boys reveal illness that caused V cancellation". August 21, 2006. Retrieved August 7, 2010. ↑ "NEWS: One Piece on Break". Viz Media. Retrieved 2013-05-21.